This is the Baird version of the quintessential Irish beer style: Dry Stout. The pitch-black color and rich, roasty dryness belie the moderate gravity and alcohol content. This Stout is meant for everyday drinking – at home or at the pub. The Japanese know their nation as the ‘island country’ (Shimaguni). So too do the Irish. Ireland’s emblematic beer is Stout. 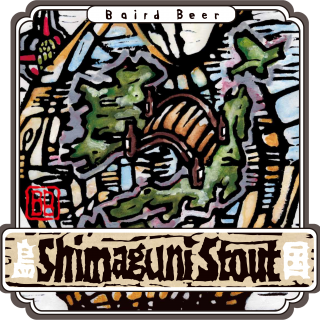 The Shimaguni Stout label artwork depicts Japan and Ireland joined together by a bridge. This bridge represents both the common historical heritage of island-country consciousness and the newly shared bond of Stout brewing excellence. The Japanese know their nation as the ‘island country’ (Shimaguni). So too do the Irish. Ireland’s emblematic beer is Stout. The average beer drinker equates dark with strong, but that is not always the case. Irish-style Dry Stouts, like Shimaguni, are strong in flavor – largely imparted from intensely roasted grains – but moderate in alcohol strength. Shimaguni Stout is the most balanced and sessionable of dark beers. Barley, next to water, is the largest ingredient component of beer. Barley is the ideal grain for beer brewing because of its large content of starch, its rich enzymatic makeup, its moderate protein level, and its husk component. All of the enzymes needed to transform the barley grains’ starch into simple fermentable sugars are present within the barley grain itself, only not in a state readily actionable by the brewer in his brewhouse. This is where Malting comes in. Malting is a process of developing the grain enzymes into a state at which they are ready and able to transform grain starch into simple sugars. The process involves steeping the grain in water, germinating and air-drying the grain, and finally kiln-drying the grain. Now it’s ready for use by the brewer. The most traditional form of malting is called Floor-Malting. In this case, the steeped barley is spread out on a warehouse floor where it germinates for several days as the maltster regularly and gently turns the germinating bed of grain while blowing air through it to help it dry. Today, almost all malt is germinated and air-dried not in this labor intensive traditional way, but rather by use of efficient and sophisticated industrial equipment. I am a sucker for tradition, however, and I find something compelling about the simple and gentle nature of manual floor-malting. Floor-malted barley costs a little more, but that doesn’t worry us. All of our base barley malt (90-plus percent of the malt we use) is floor-malted. Shimaguni Stout is a beer where barley (both floor-malted and un-malted) is the star ingredient. Floor-malted Maris Otter contributes most of the sugar content while the midnight-black color and roasty burnt character derive mainly from additions of un-malted and highly kilned Roast Barley – the signature ingredient in Irish-style Dry Stout.